The massive workforce that keeps our nation’s infrastructure running and expanding will continue to grow during the next decade, creating high-paying jobs and revitalizing local economies. The massive workforce responsible for planning, building, supporting and governing the nation’s infrastructure is poised to see major increases in the coming years and will play a role in the continued economic revitalization of the country, according to a report released by the Brookings Metropolitan Policy Program. According to the report, titled Beyond Shovel Ready: The Extent and Impact of U.S. Infrastructure Jobs, infrastructure occupations are projected to increase 9.1 percent over the next decade. This figure includes the need to replace more than 2.7 million workers due to retirement and employment shifts. According to the report, these jobs will help cut down on unemployment rates and help re-invigorate local economies. But even now, the size and scope of the infrastructure industry is much larger than it is conventionally understood to be, the study found. In 2012, 14.2 million workers were employed in infrastructure positions across the country, making up 11 percent of the national workforce. According to the study, workers in infrastructure occupations earn higher wages at their 10th and 25th percentile ($24,750 and $30,190) relative to all workers in the U.S. ($18,090 and $22,480). 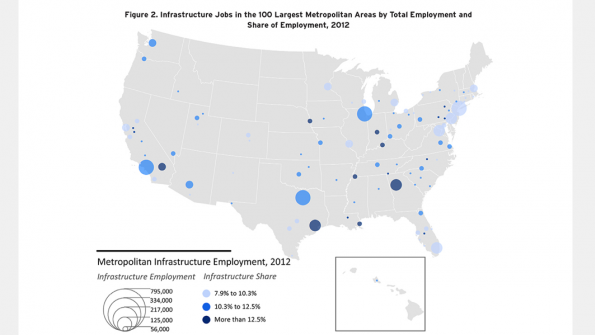 High-paying infrastructure work plays a key role in driving metropolitan economic growth, according to the study. Combined, 9.1 million workers are employed in infrastructure jobs in the 100 largest metropolitan areas, where they make up 64 percent of all U.S. infrastructure employment. The study emphasizes that infrastructure jobs aren’t necessarily short-term construction projects. The vast majority of these jobs, 77 percent, focus on operating infrastructure rather than constructing, designing or governing it. To read the full report, complete with interactive tools, click here.